You look super-lovely! Your nail polish makes me want to toss my muted-pink shades and steal yours!! Your outfits are so cute. I love the wellies! I like wearing wellies too. I would love ones pink or with polka dots <3 they look so cute with dress and long socks. Oh you look lovely in that dress w/the peter pan collar. 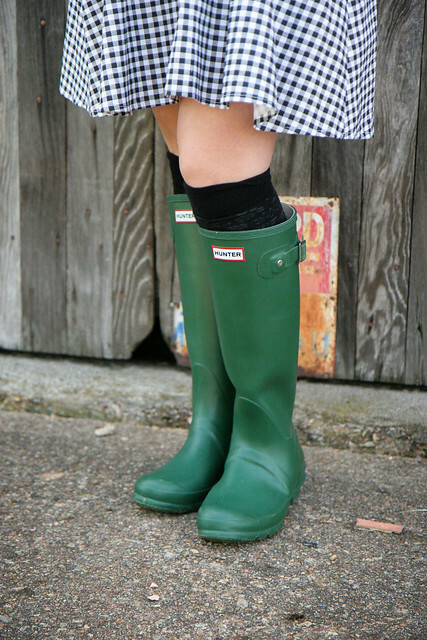 I'm also green w/envy over the Hunter boots. Cute boots! Keep 'em on! We have more rain coming this way!!! um, hello cutest blog i've ever seen. Adorable! I love the green wellies with your fantastic RV dress. It looks like you should be skipping through a field of flowers, hehe. love the outfit! you're so cute! 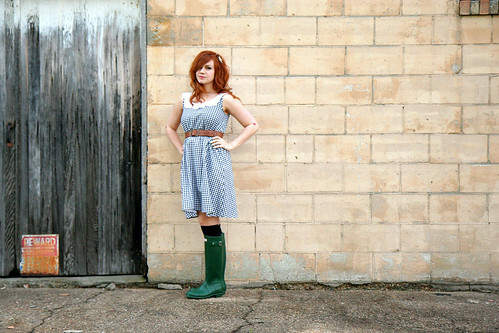 super cute outfit, I do love dress/welly combo too - and you are totally rocking it! i miss you buddy :) xo!! Hi Katie, so nice to see you wearing your Rubber Wellingtons you look really cool. New reader here- found you from your hair tutorial on Elsie's blog the other day. Love your blog! && This outfit is so cute! Love the dress, wellies, hair clip and of course your gorgeous mane! I love giantdwarf; I use her fancy felt for some of my items.